99% of the critically-endangered Tristan Albatross breed on Gough island. © The Royal Society for the Protection of Birds (RSPB). 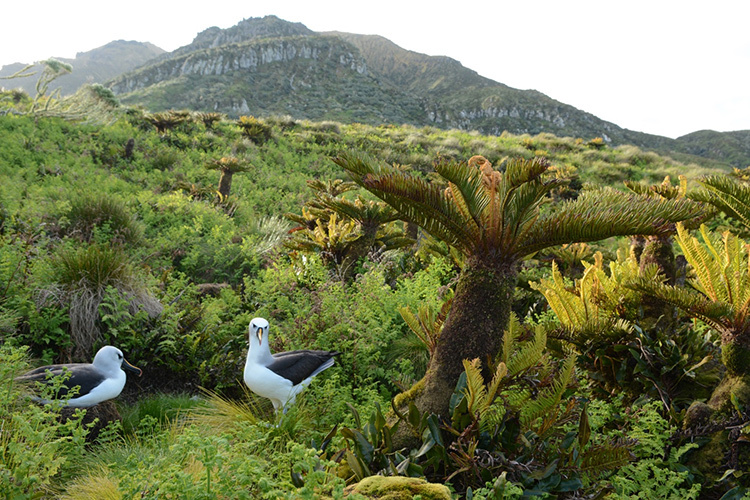 With its large bog ferns and other distinctive flora, the plateau of Gough forms a unique habitat for the Atlantic Yellow-Nosed Albatross. © The Royal Society for the Protection of Birds (RSPB). 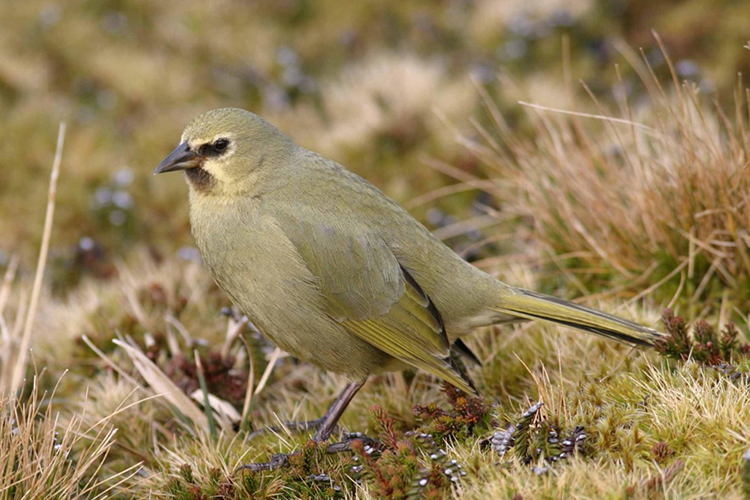 Endemic to Gough Island, there are perhaps only 500 Gough Buntings left in the world. © The Royal Society for the Protection of Birds (RSPB). 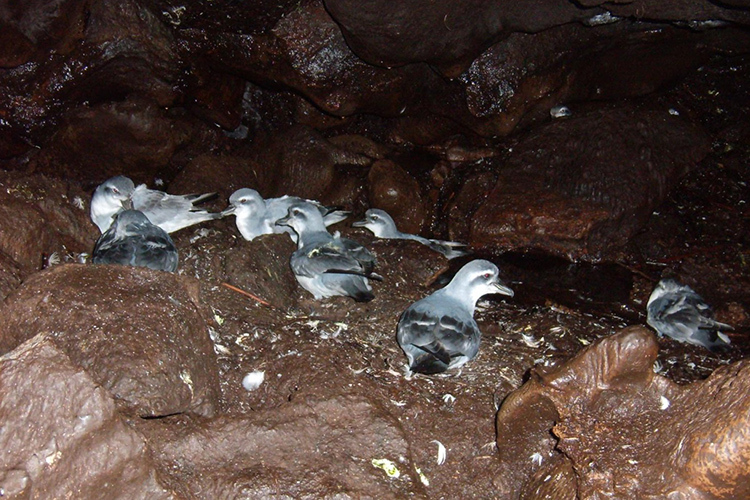 MacGillivray’s Prions breed in the burrows and caves on Gough Island. In the last two years, these birds had no success in raising their chicks. © The Royal Society for the Protection of Birds (RSPB). Gough is home to more than a fifth of the world’s endangered Northern Rockhoppers. © The Royal Society for the Protection of Birds (RSPB). Predation by mice has also reduced the breeding success of Tristan Albatrosses to less than 10% overall. © The Royal Society for the Protection of Birds (RSPB). The eradication of the non-native mice will be achieved using helicopters spreading bait in specially-modified agriculture fertilizer spreaders. © The Royal Society for the Protection of Birds (RSPB). Most will never have heard of Gough Island; fewer still will ever see its sheer-sided cliffs rising like a fortress a thousand feet high above the surrounding, roiling grey ocean, or the clouds of seabirds, a million-strong, circling over its stony ramparts. Remote and isolated, Gough Island sits alone in the South Atlantic. Its closest neighbor is Tristan de Cunha, often referred to as the most remote human outpost on the planet. 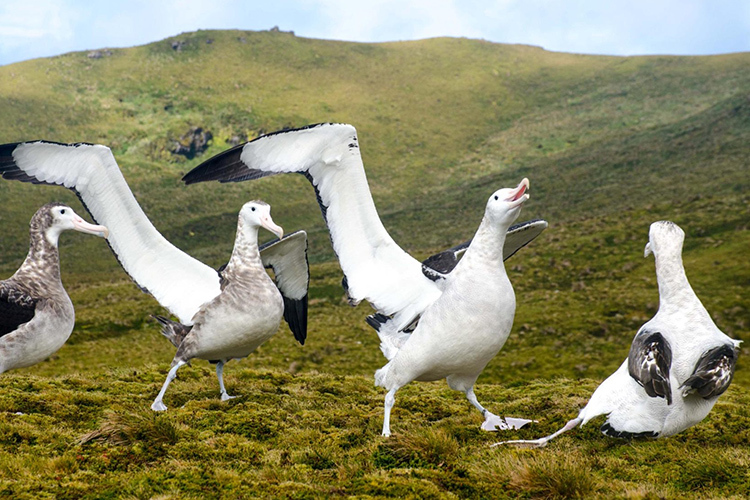 To the sea-birding fraternity, however, Gough Island will be well-known as perhaps the single most important seabird island in the Atlantic, perhaps the world. A seabird citadel that provides a home and refuge to literally millions upon millions of seabirds that range in size from diminutive Storm Petrels which can fit into the palm of one’s hand to mighty albatrosses, the largest and longest-lived of all flying birds. In addition to its two million pairs of Great Shearwater, the island is also critically important for such breeding species as the Tristan, Sooty, and Atlantic Yellow-nosed Albatrosses; Atlantic, Soft-plumaged, Grey and Kerguelen Petrels; MacGillivray’s Prions; and the delightful and critically-endangered Gough Bunting. At first glance, Gough appears to be a virtual paradise and yet, all is not well. Gough needs our help, else all will be lost forever. Two centuries ago the Common House Mouse was inadvertently introduced to the island by whalers and sealers. Left unchecked, they have multiplied and grown into “Super Mice,” two and three times the size of an ordinary mouse. 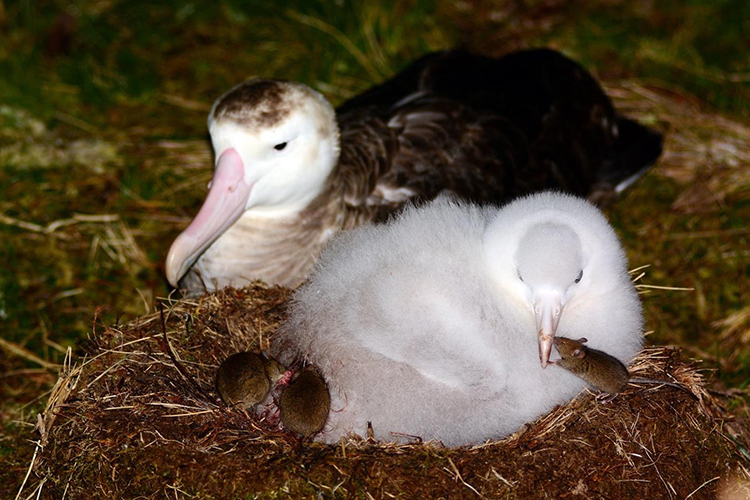 Each year they kill tens and tens of thousands of eggs and chicks, sometimes even taking adult seabirds up to the size of albatrosses. The situation is out of control and several bird species face imminent extinction unless we act fast and decisively to avert a total and unthinkable disaster. I therefore applaud the recent announcement from the Royal Society for the Protection of Birds (RSPB) in the UK. 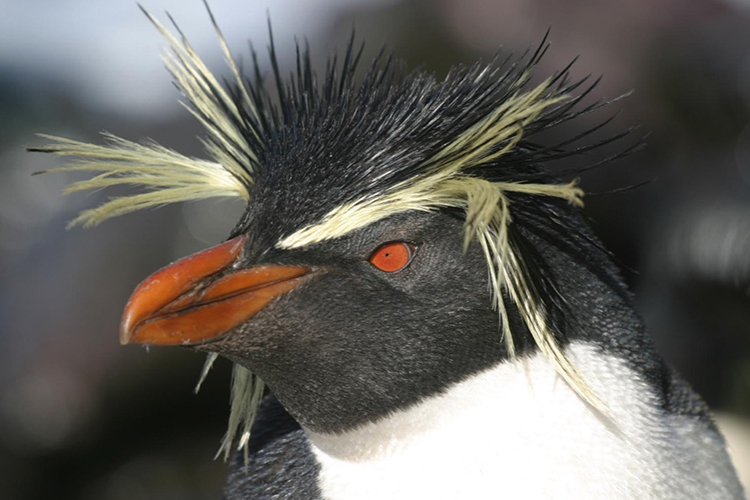 They have given the go-ahead for a £7.6 million (over $10 million USD) Gough Island Restoration Program to be carried out in 2019. As an ardent conservationist who has been involved in introduced species eradication projects at both South Georgia and Henderson Islands, I cannot stress enough the importance of Gough Island to the world. I regard Gough’s restoration as the single most important conservation program underway today! The solution is relatively straightforward but the operation will be logistically complex, mainly because of the island’s remoteness. Gough is 1,550 miles (2,800 km) from South Africa. All staff and equipment must be shipped to the South African weather service base on Gough. 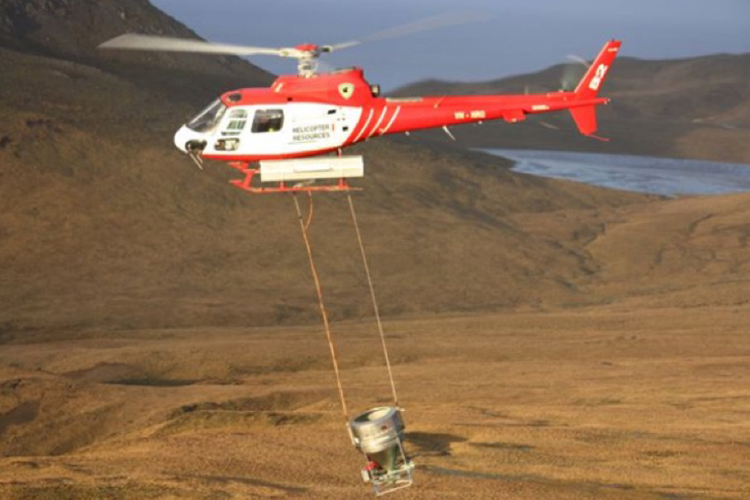 The eradication of the non-native mice will be achieved using helicopters spreading bait in specially-modified agriculture fertilizer spreaders. These helicopters will be piloted by highly-experienced pilots, each guided by the Global Positioning System (GPS). I hope that you will join me in pledging your support to this globally important project. We simply must not fail. The birds of Gough Island need and deserve our support and stewardship to return the island to its former pristine state. For those of you who want to help right away, details on how to support the Gough Island appeal can be found at the RSPB web site: www.rspb.org.uk. In the coming months, we will have further information for individuals in the US on how you can make a tax-deductible contribution to a US-based non-profit partner organization dedicated to raising funds for the Gough Island Restoration Program. Those of you who are joining our Cape to Cape expedition in February 2018 will see Gough Island with your own eyes, as we cruise by Zodiac around this rarely-visited island. On Apex Expeditions’ previous visit, we were treated to memorable views of Sooty Albatross perched on grassy cliffs as Spectacled Petrels soared over us, and White-bellied Storm-petrels danced on the water around our Zodiacs. Several Gough Buntings were seen in the shoreline vegetation. For the seabirders, however, the critically endangered Tristan Albatross was the bird of the day. Whether you choose to travel with Apex to Gough Island or join us in pledging your support to the restoration efforts, I hope that together, we can ensure the future of Gough Island’s endemic species. Ever so happy to hear that there is real commitment on this front. I look back on our Cape to Cape trip in 2016 as a terrific experience in getting to exciting remote places. The afternoon drifting around Gough was magical. I am sure that you are key factor is keeping this ball rolling. Bravo! Well done, Peter! Please keep all of us US birders posted on donation methods. I may never get to Gough, but I need to know it’s there and thriving!